Nanci Armstrong-Temple is an activist, educator, organizer and social permaculturist. She is the daughter of a Black revolutionary/former Black Panther father and a white abolitionist Unitarian Universalist Mother. A lifelong practitioner of self-determination, disobedience, non-violent resistance and peaceful communication practices, Armstrong-Temple is able to sit down with almost anyone in order to listen deeply and help co-create a life and a world more in alignment with one’s own gifts and integrity and highest good for family and community. Nanci has taught and begun music, dance, garden, coaching, and musical theater programs in Alameda, Oakland, Berkeley and Los Angeles unified school districts, Children’s Hospital Los Angeles, churches, the YMCA and street parties up and down the 101 and back. Her gifts are direct action through song, grassroots community organizing, strategic planning, and coordinated shut down of major hegemonic infrastructure, especially bridges, freeways and city halls as a call to realize beloved community. She has ten year old twin girls who are the light of her life, and she wakes up every morning grateful to get to be the parent of two such wondrous people. Nanci lives an embodied praxis at the intersection of theory and practice. She holds a BA in Educational Anthropology from UC Berkeley, is a co-creator of PEACE Out Loud, a member of the #BayBridge25, part of the Anti Police-Terror Project’s Black Leadership Committee, an unapologetically Black queer woman, Mama to twins, and a fierce advocate for love and community self defense. and practice all of these skills as well as to build new skills rooted in activism and playfulness. 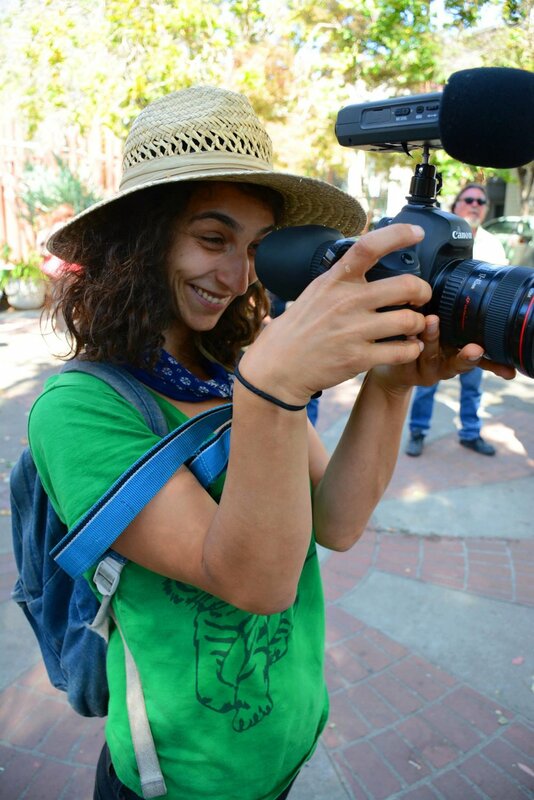 Noemie is an Oakland-based educator, filmmaker and community media maker. Her film work explores how art can be a tool of resistance, liberation and community building. As an educator, she loves the challenge of creating a just, safe and encouraging environment for kids to grow into their full selves. Working at PEACE Out Loud has been a wonderful opportunity to ground her social justice organizing in community, by weaving relationships with kids and families from the neighborhood she lives in.